Our graphic designers listen to you, then put your requirements into their designs. Your website is designed around your specifications. From the first meeting, your ideas for your website are taken into account and drawn into a number of designs specifically for your requirements. No two websites are the same. The functionality of a website is built to reflect your requirements. We don't use any form of template or open source software like Joomla, Magento or Wordpress so your website is tailored specifically for your requirements. Each website is a bespoke design tailored to your requirements allowing you to have the website you need without going over your budget. Each website comes with a free Personalised Content Management System allowing you to update it when you want. The website should do the hard work so you don't have to. 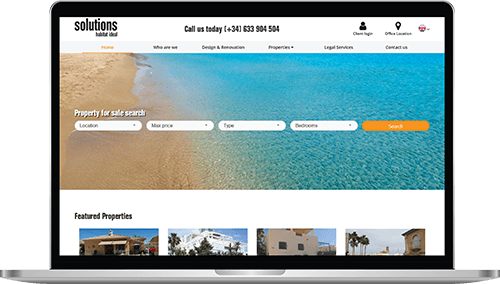 We are a website design company based in Almería, Spain but our work takes us all over the UK and Europe. We tailor make each website for the individual meaning we do not use any form of template when designing a website. Each website starts with a blank canvas and our clients are consulted every step of the way, until their website looks exactly how they want. We have several satisfied customers and you can see links to their websites via our Portfolio page. Our refusal to use open source templates like Joomla, Drupal or Wordpress we believe gives us an advantage over other web designers. We firmly believe that our refusal to use templates means that we are not limited in what we can offer for our clients websites. If you want your website to work a certain way, or actively email your clients on a regular basis, no problem, we can write your website however you choose. We have a transparent pricing policy, low cost setup and all websites are Search Engine Optimized and written with a personalized Content Management System as standard. Why not give us a call today on (+34) 600 284 975 to find out how we can help you. Being based in Spain is not a barrier to working in the UK. Our first language is English and we regularly travel between the UK and Spain for work and personal reasons. The climate just suits us better in Spain so we spend more time there. We have many clients based in the UK who we have built up successful relationships with. With the internet breaking down international barriers and long distances, we are able to communicate with clients in London and the South of England using Skype or Whatsapp to allow us to build a website with maximum input from the client. Our low prices are also helped by the strong pound, giving clients in the UK even more for their money.